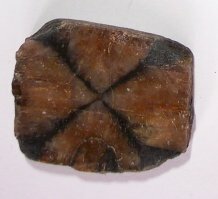 Also known as "Fairy Cross Stone"
Chiastolite is a very powerful stone. It can be carried for increased power or placed upon your altar to increase magickal power during rituals of all kinds. It is particularly useful in elemental magick. Chiastolite is often carried as a general good luck stone.